How to edit tasks and delete tasks from your account. Select the task you want to edit. The task detail panel will appear on the right side of the screen. Click on the task menu button (…) and select ‘Edit Task’. Update the task’s details as required and click on 'Save' to save your changes. 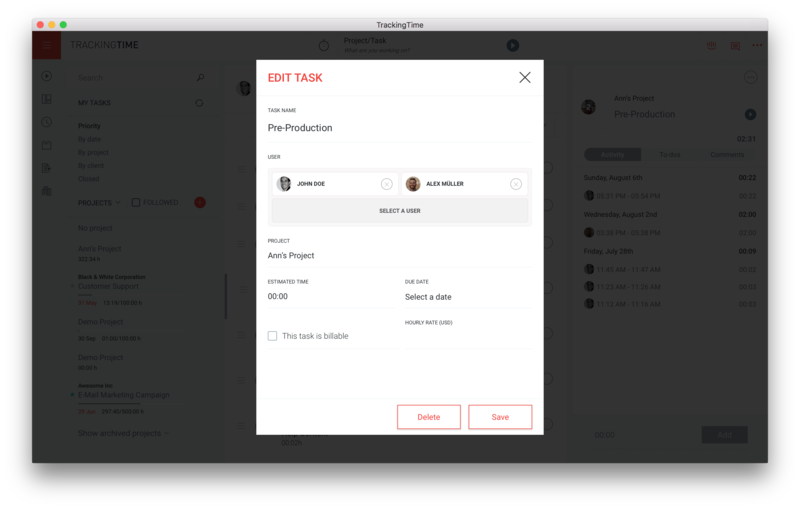 You can move an existing task to a different project anytime using drag & drop. Drag the task you want to move by clicking on the hamburger icon next to the task name and drop it on the project you'd like to move this task to. The total time tracked against this task will be removed from the original task's project and added to the new project. Select the task you want to delete. The task detail panel will appear on the right side of the screen. Click on the task menu button (…) and select ‘Delete’. A confirmation pop-up will appear. Click on ‘’Delete’ to permanently remove this task from your account. Warning: When you delete a task all associated time entries will also be deleted. This action cannot be undone.